During a long and physically challenging training program, I was very fortunate to work with Divya Kohli, who was strongly recommended to me by a colleague at Middlesex County Cricket Club. Divya instructed a series of challenging, progressive and well structured yoga sessions with all members of our professional cricket squad. Divya used her extensive knowledge of yoga techniques to adapt sessions according to the demands of professional cricket, and her positive demeanour and enthusiasm brought both enjoyment, and objective led focus, to each session. The players at Middlesex County Cricket Club benefited hugely from Divya’s work, and the education they gained from the experience has formed a strong contribution to their physical development. I would not hesitate to recommend Divya to anyone, both inside and outside the world of sport. From the first minute of the first session, Divya was fantastic. Our expectations and what we wanted to get from the sessions were discussed on an ongoing basis and Divya continually structured the classes to meet these requirements whilst also offering alternative moves/positions for people with previous/current injuries. The classes where challenging, dynamic and enjoyably varied. The whole team can not speak highly enough of Divya, an engaging and infectious teacher with an obvious passion for Yoga that shines through with any class she takes. After just one session the tightness in my chest and ear and head pain, which I had had for a long time, cleared… amazing. “After just one session the tightness in my chest which I had for a long time cleared and even the pain in my ear has gone, amazing – I was not quite expecting this! Things are being realigned emotionally, and I am feeling less stuck”. “I began yoga lessons with Divya after having experienced neck and lower back disc problems. As a result, my interest in it was purely from a medical standpoint, but after the first session, it became apparent that the rewards to my health were to be greater than I’d anticipated. “We have been doing weekly yoga lessons with Divya for over two years. We had never done yoga before, and started off hoping it would be a gentle way of improving our physical fitness. Divya has been a wonderful yoga teacher. She makes each lesson different, varying the rhythm, the nature of the exercises, and the intensity, depending on the time of the day and how energetic we are. She has a calm yet cheerful persona. She is gentle while encouraging us and pushing us to explore how far we can go with a particular pose. She tailored her initial lessons very well to our physical limitations as beginners. Some months ago, one of us suffered an illness and she adapted the lessons immediately to allow for that particular problem. She has been flexible, accommodating changes in schedule if required. 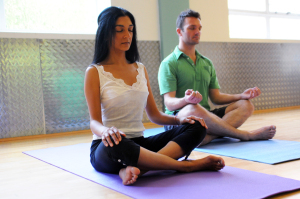 “In the summer of 2009, my husband and I commenced Yoga sessions with Divya. My husband was sceptical to say the least but he was willing to give it a go, no doubt in hope of getting me off his back!! However a year on, he is stronger, more flexible, more relaxed, more focused and free of any cynicism he may have once had. On a personal level I too feel more focused, more relaxed and when things feel a little overwhelming my lessons with Divya lift the load without a doubt. Her ability to keep our concentration throughout the lesson is amazing, her thorough, attentive teaching has inspired us to explore other meditative practices. Divya also teaches our daughter who has enjoyed all her lessons so far and appears much more relaxed and comfortable in her very being. “Divya is a wonderful teacher. She is very knowledegable about so many aspects of yoga. She explains the mental and health benefits of the poses in detail and always encourages questions. She creates such a calm atmosphere in class, with incense and candles as well as soft music. Her classes are so well pitched to each level of learner, since she differentiates each pose and provides options for all types of fitness levels while still making sure that the class is challenging. I really like that Divya gives time to focus on the inner as well as the outer yoga journey. She pays attention to each student in class, making each accountable for their practice, but never judging.